36.70mm x 47.60mm 18K 5N pink gold case, silvered sand blasted dial, manual-winding 4400 AS movement with small second hand, approximately 65 hours of power reserve, Mississippi alligator strap. Water resistant to 30 meters. 36.70 x 47.61 18K white gold case, 9.25 mm thick, transparent sapphire back, dark grey dial, Caliber 4400 AS manual-winding movement with hours, minutes, small seconds, approximately 65 hours of power reserve, grey alligator Mississippiensis strap, 18K white gold ardillon buckle. Water resistant to 3 bar. 36.70 mm x 47.61 mm 18K white gold case, 9.25 mm thick, 18K white gold bezel, silver dial, caliber 4400 as manual movement with minutes, small seconds at 6 o'clock, hours, small seconds, approximately 65 hours of power reserve, black alligator strap, ardillon buckle. Water resistant to 3 bar. 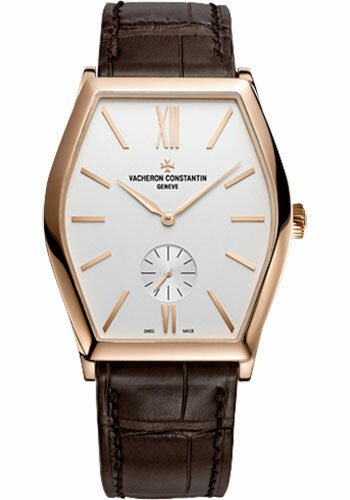 36.70 x 47.61 18K 5N pink gold case, 9.25 mm thick, transparent sapphire back, dark grey dial, Caliber 4400 AS manual-winding movement with hours, minutes, small seconds, approximately 65 hours of power reserve, black alligator Mississippiensis strap, 18K 5N pink gold ardillon buckle. Water resistant to 3 bar. 36.70 mm x 47.61 mm 18K 5N pink gold case, 9.25 mm thick, 18K 5N pink gold bezel, silver dial, caliber 4400 as manual movement with minutes, hours, small seconds, approximately 65 hours of power reserve, dark brown alligator strap, ardillon buckle. Water resistant to 3 bar.